In this month's issue of Grand Designs Kevin McCloud sheds a little light on one of his essential stove accessories. "Those of us in possession of a Woodburner have been stoking them into life since autumn, and as long as the wintry nights continue and the mercury tumbles, we won't be stopping anytime soon. 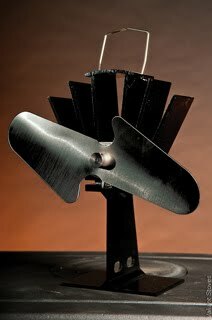 Hence the need for a stove fan, a simply brilliant idea, it sits on the Woodburner and blows the warm air from around the stove into the room and it is powered entirely by the heat generated below it. Benjamin Franklin may have been clever enough to invent the Woodburner, but his brain wasn't quite able to get round thermoelectrics!" A simple flow of heat from hot metal to cold metal through a special layer that generates electricity and turns the fan blades and gently pushes warm air into the room! The blades of the stove fan spin silently and efficiently, circulating the warm air around the room, the blades spinning faster as the stove heats up and then slowing and finally coming to a stop as the stove cools.This can circulate up to 25% more heat into the room, reducing the amount of wood you need to burn and saving money!